I am frequently amazed by the number of people who I meet in my training sessions who use PowerPoint as a key tool for their jobs, regularly stand up and present to groups of customers or colleagues, and have never even heard of Presenter View, let alone used it. What does Presenter View offer? This means that you can sit or stand facing your audience without needing to keep turning around to see the screen to know where you are up to (or far worse, to read it out to your audience). It can also help you to follow good practice and avoid including lots of things on your slides to remind you what to say, by making everything easily available in your notes section. This means you can remove lots of the words from your slides – or perhaps all of them, using only a picture to illustrate your topic. If your job involves any kind of data visualisation from simple Excel charts to fully interactive management dashboards, you need to make sure that the way you display your data is as clear, unambiguous and effortless (to produce and to interpret) as possible. Last year I attended three days of workshops by one of the foremost proponents of best practices in information visualisation, Stephen Few, founder of Perceptual Edge. Although I already had two of his books and had devoured their contents, there’s nothing like in-person training to highlight the most important ideas and make them stick. If you missed out last time around, Stephen is back in the UK from 6th to 8th July 2011, and in Vienna from 5th to 7th October. In between interactive question and answer sessions, and some individual and group workshop time there was plenty of explanation of current understanding of how the human brain works to interpret visual displays of data. This combination of applicable, real-world best practice, backed by solid theory and research is a sound approach to take – you want to know that the ideas and principles under discussion are not just one person’s strongly-held viewpoint, but demonstrably better for interpreting, analysing, understanding and communicating your business or research data. I already used many of the techniques which were discussed, and even teach others how to achieve these in practical situations, such as using workarounds to get Excel to do some pretty advanced chart displays, get better reports out of Dynamics CRM, and use clear visualisations when producing presentations. I still learned a great deal though, and came away from these workshops with a much clearer set of tools to explain to people how to better understand the information in your data (for analysis and decision making) and communicate this to others clearly (for reporting or dashboard style displays). Stephen Few has many years of experience in this field, both in academic circles (he teaches in the MBA program at the University of California) and with businesses and corporations in many different industries. His mastery of the subject, leisurely delivery and down-to-earth style made these workshops as enjoyable as they were educational. Susanne Dansey of Purple Cow Ideas Management has created a great Slideshare presentation with insight from a whole bunch of people from all sorts of backgrounds, with a range of skills and experience in different fields. She has collected their thoughts about the last year and their visions and advice for 2010. It’s an intriguing cross-section of quotes, perspectives, and inspiration for anyone in business, and maybe for your personal life too. This also contains some great examples of varied slide layouts and clean lines, it’s worth a look just for some inspiration to brighten up your next presentation. I have a golden rule which is that all slides in a PowerPoint presentation MUST have titles, which I mentioned in an earlier post about using large images in PowerPoint. Before I get hundreds of comments saying this is nonsense, and “less is more”, I just want to be very clear: every slide must have a title, they just don’t necessarily have to be visible to the audience. The minimalist, image-led approach often recommended by followers of Presentation Zen and Beyond Bullet Points (and others) can be very powerful and really help to get your message heard and understood, but people often take it too far and actually delete the title placeholder from their slide, or use the “blank” layout. Even if you don’t want to put words on your slides to show the audience, you should still keep the title, and I’ll explain why and how to achieve this, and discuss a couple of things which might catch you out. I have recently been doing some restructuring of my company website at www.meteorit.co.uk – it’s still very plain and simple but I have tried to tick all the appropriate boxes for accessibility, usability, standards compliance and above all giving people clear information about what my company does and does not offer. Later I may give it a bit more corporate gloss and “pictures of people in smart suits drinking cappuccinos in a meeting, and someone good looking with a headset on smiling at the camera” (to quote a friend who kindly gave me their thoughts on what it was missing). As regular readers will know, clear presentation of information is a hot topic of mine, particularly when I am delivering software training. As I am a MOS: Master I do a lot of Microsoft Office courses, and try to focus not just on the features of the applications but also advise on good practices. This might include clear layout of a Word document, suitable formatting of an Excel chart, or the whole process of designing a professional presentation to deliver your message clearly and avoid “death by PowerPoint”. Albert Einstein famously said “Everything should be as simple as possible, but not simpler” in reference to physics and its explanations of the Universe. It might also apply to PowerPoint presentations, where it is too easy to clutter slide with too many bullets or too much information and detail. For example, a chart with comparisons of twenty products across three sales regions for the last four quarters – with all the individual sales figures attached to each part of the stacked bar, of course. Don’t do it. Keep it simple. Provide enough information in the visual aid to make the point (eg Widgets are selling more than ever, and sales in Toyland are decreasing) but no more than that. Use the speaker’s notes to provide you with the extra detail if you need to refer to the numbers, and include these notes in the handout so people can digest them later if they want to. Think about using some hidden slides so you have a selection of related charts and / or figures which you can show in response to a direct question, but will not bore the audience with if they seem uninterested (or simply happy to take your conclusions at face value). Handouts are also the right place for giving the source of your data and any appropriate caveats such as how many people were surveyed in a poll, or what exchange rate has been used to compare sales across currencies. A good technique to deliver a more professional presentation is to think about what the audience would write down if there were no handouts. What would be the really important things they chose to take away? So why try and ram anything else through their eyeballs and into their brains? 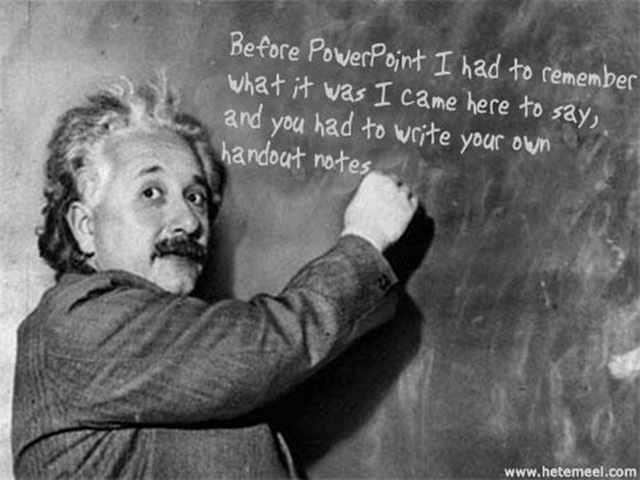 One of the training courses I run is about producing and delivering better PowerPoint presentations. 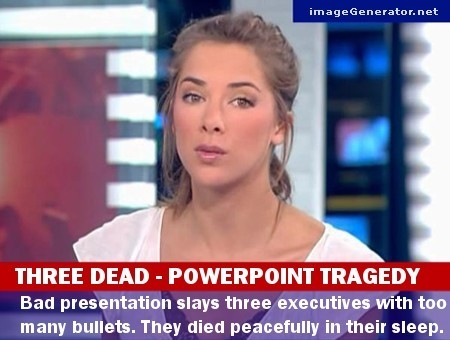 This looks at ways to avoid Death by PowerPoint by using well-crafted, visually attractive slides to provide maximum impact and increase audience understanding and information retention. In a future blog post I might collect some thoughts together around that topic, but for now I thought I would link to a pretty good example. Given that this is a slideshow with no presenter, there is text accompanying pictures which would not necessarily be the case if it was speaker-driven. However, it is still a great example of visual impact to deliver a strong message. Notice that because of the limitations of SlideShare (and good taste on the part of the designer) there are no animations, no builds, just pure, simple, accessible slides. One of the disciplines I ask my course delegates to adopt is to print their slide deck in black and white, 6 slides to a page. Only if their slides are readable and make sense (and have impact) in this format will they be successful for a presentation. Maybe my new discipline should be “post it to SlideShare” which has similar limitations of size* and lack of animation . *I know you can view it in full-screen mode but many people won’t do this, and those that do often want to see if the first couple of slides draw them in before doing that. The Brand Gap Presentation is also an interesting insight into the topic of branding and marketing, which is often a theme which comes into choice of presentation style and touches on some of the areas I teach. Your brand is not what you say it is, it’s what they say it is.